Theoretician,Historian,Obsessed Graff/StreetArt writer are some of the titles Daniel Feral lists on his twitter page. We agree with the obsessed part as Daniel Feral has taken on the huge task of documenting and trying to develop a clear history of today’s most prominent art forms, Graffiti and Street Art. 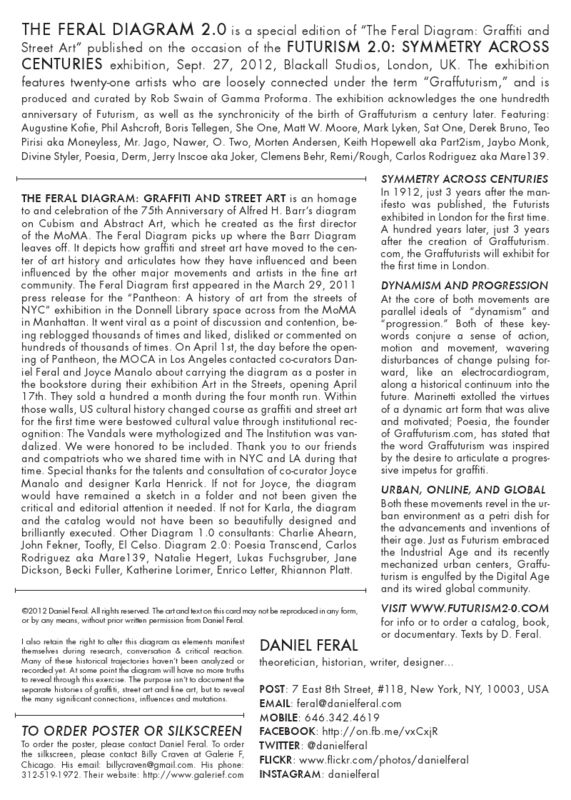 Daniel Feral first released the original Feral Diagram in 2011 as part of the successful Pantheon Projects Group show in NYC which he co-curated. 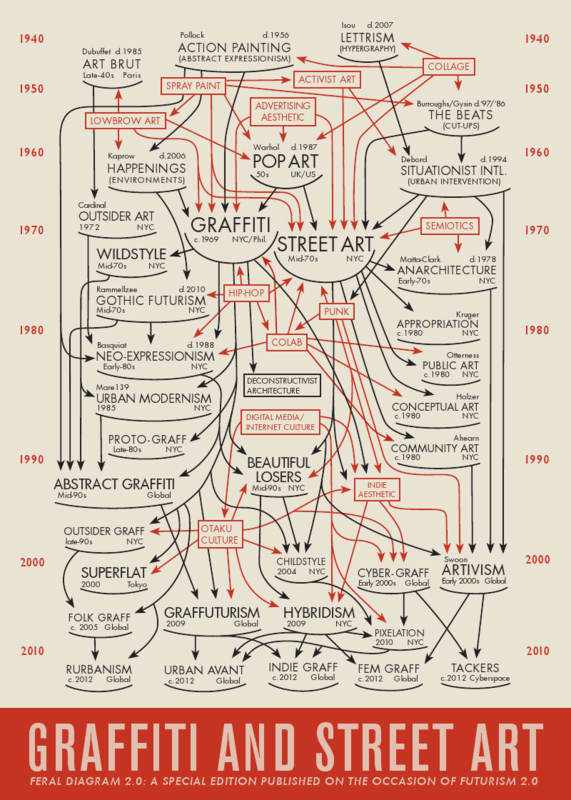 The diagram is a widely discussed and debated diagram that was able to bring about exciting academic conversations about street art and graffiti. Daniel has recently written the upcoming book and catalog for the Futurism 2.0 “Symmetry across Centuries” group exhibition that opens this Thursday in London. With new research and recent writing, Daniel felt it was a good time to release a revised version of the diagram and has dubbed it Feral Diagram 2.0. You can order a copy of the newly released poster here. Daniel will also be at the opening of the exhibition documenting and taking part in the festivities. Make sure to stop by and get a signed copy from the writer himself. We are excited to see a writer and theoretician take initiative in the documentation and critique of our art form. We have always said without proper discourse and written essays on the subject it will be tough to have our voice heard. Daniel is a writer in the middle of the movement who is not an outsider, yet is able to remain subjective. The new diagram is another example of the evolution in our history, and we appreciate Daniel’s contributions. Make sure you support the diagram by buying a poster.